Let me begin by saying "screw you Bill Simmons, you sanctimonious prick." You've been crowing all year about how the "Karma Police" are going to catch the Ravens for their handling of the Ray Rice incident. Meanwhile, your favorite team of proven "Spygate" cheaters waited until Aaron Hernandez was arrested before finally releasing him despite a checkered past that included, among other things, punching a waiter outside of a restaurant in college, a domestic incident in June of 2012, the implication of Hernandez in a double murder in July of 2012, another domestic incident in March of 2013 and yet ANOTHER domestic incident in April of 2013. (I only listed the ones where the police were involved. For a full list, click here). The Patriots had full knowledge of all of these incidents yet kept Hernandez on the payroll because he was so valuable to the team. It wasn't until he was actually arrested for murder that they decided to release him and even then, it took them a week to do it. 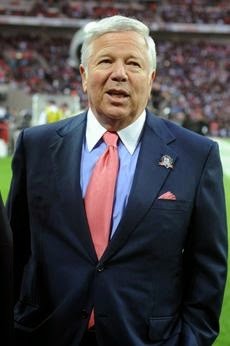 Stay classy Robert Kraft. Maybe you're just trying to throw your readers off the scent of the true scumbag organization or maybe you just suffer from the common ailment of Male Boston Ignorance (MBI) which severely impairs the judgment of fans from the Northeast and leads them to believe that they are collectively anything more than a bunch of overbearing self-involved dickheads. By all means go ahead and keep demonizing the Ravens and Roger Goodell and continue to ignore the fact that the Patriots knowingly employed a violent criminal. Oh, and as you rail against Goodell, take a moment to consider who primarily influences the people pulling his strings (at least according to the Sports Business Journal). And then do us all a favor and get over yourself. Now that I've gotten that off my chest, time for some picks. In his last nine playoff games over the past five years, Quarterback "A" has thrown 20 touchdown passes with 2 interceptions and has averaged 252 yards per game. His team is 7-2 over that span. Over the same number of playoff games and the same timeframe, Quarterback "B" has thrown 17 touchdown passes and 10 interceptions while averaging 274 yards per game. His team is 4-5 over that span. Of those nine playoff games, Quarterback "A" has played two at home, six on the road, one at a neutral site and his team has been the underdog in six of them. Quarterback "B" has played seven of the last nine playoff games at home, one on the road, one at a neutral site and has been the favorite in all but one. The team led by Quarterback "B" is favored by 7 points over the team led by Quarterback "A" in this game. (Joe Flacco is Quarterback "A" and Tom Brady is Quarterback "B." I know that was pretty obvious but I wanted to make sure the Patriot fans got it). And one more point. Once you get through the big names in this game like Brady, Flacco, Gronkowski and Revis, the next best five play defensive line or linebacker for the Ravens including Terrell Suggs, Elvis Dumervil, Haloti Ngata, Courtney Upshaw and C.J. Mosley (who as a rookie was 7th in the league in tackles). Maybe this is the playoff game where Bill Belichik finally out-coaches John Harbaugh, Brady stops choking against the Ravens when it counts and the Patriots escape with a victory. At some point they're bound to live-up to the hype but, even if they do on Saturday, it's not going to be pretty so I'm taking the points, the defense and Quarterback "A." We can be pretty confident that the Seahawks are going to win this one as all the Panthers had to do to beat the Cardinals last week was get out of the way and let Ryan Lindley hand them the game . . . and they almost screwed that up with stupid turnovers, penalties and a punter who inspired one ESPN analyst to ask, "Is Butler punting a bowling ball?" Now they visit the other end of the spectrum in a game on the road against a team that isn't going to give them anything. And beyond that, the Seahawks want to start laying the foundation for the NFC Championship game by annihilating the Panthers so that the Cowboys and the Packers get the message that their trip to the Northwest in January is going to be about as fun as well, a trip to the Northwest in January. Applying the transitive law to football games never seems to work because it fails to take into account that fifty three men might play football differently from one week to the next. In other words, just because a > b and b > c means that a > c does not also mean that if the Packers handled the Lions by 10 points in Week 17 and the Cowboys needed a play that involved the most dubious officiating in the history of the NFL to beat the Lions at home by 4 points last week, the Packers are going to win comfortably over the Cowboys on Sunday. But if that's the case, then why do I feel so confident that this game is never going to be in doubt and we're headed for a marquee NFC Championship Game showdown in Seattle? I mean the Cowboys have now won five games in a row including a solid performance in Philadelphia with the division on the line and then a blowout of the Colts the following week. Even with all of the help from the officials, they still had to make the plays to beat the Lions and they did (though all you apparently have to do to beat the Lions when they're on the road is give the ball to them with a chance to win it and then watch their offensive line crater). And probably the biggest "X" factor in the Cowboy's favor is the health of Aaron Rodgers who has something between a cramp and flesh eating parasite in his calf (depending on who you talk to) that is going to limit his mobility which is part of what makes him great . . . but not the main part. Everyone is making a big deal about the Cowboys going 8-0 on the road this year and, while that is impressive, it should be noted that only two of those games were against teams with winning records including a win over the Seahawks when they were still dysfunctional back in October and another over the Eagles once everyone finally figured-out that all you had to do to beat them was sit back and let Mark Sanchez be Mark Sanchez. Meanwhile, the Packers went 8-0 at home averaging 40 points per game while outscoring their opponents 318 to 163 and that included recent wins over the Patriots and Lions. In the end, I just couldn't pick against Rodgers playing at Lambeau even if I wanted to, which I don't. I'm still wearing the look of a guy who missed a two foot putt to win the Masters over my decision to pick Andy Dalton and Marvin Lewis on the road against Andrew Luck last week. I wanted to change that pick the moment the game kicked-off because the mere sight of Dalton on the sideline told me I had screwed-up. I initially picked the Colts in this game but then realized that my belief in them was being overly inflated by that uninspiring win. The fact is that the Colts stunk on the road this year, especially on defense. They played six competent teams away from home (not counting the Jags and Titans) and they allowed an average of over 33 points per game and that number goes up to over 41 points per game against playoff teams on the road (Broncos, Steelers and Cowboys). Then we have the Broncos who've kind of been flying under the radar ever since they lost the Home Field Advantage Bowl to the Patriots back in November. Since then, they dropped a couple of stinkers to the Rams and the Bengals but those were both on the road against pretty solid defenses. They have also used that time wisely to develop a running game behind C.J. Anderson who has averaged 95 yards and a touchdown in each of the last eight games. The concern is that Peyton Manning's performance in December has, to put it bluntly, sucked as he's thrown 3 touchdown passes and 6 interceptions in his last four games. "DON'T YOU KNOW WHO I AM!?!" I am going to choose to ignore Manning's mini-slump because he's had two weeks to figure things out, the weather is supposed to be mild in Denver and, as good as the Colts' defense looked last week, you need to take into account that Andy Dalton has made a lot of playoff defenses look good in his career. 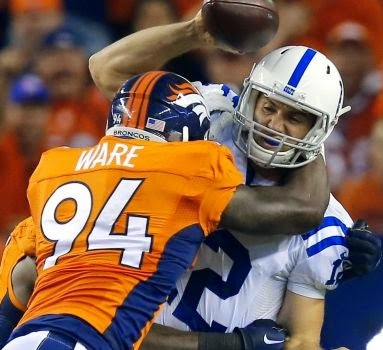 On the other side, the Broncos defense is going to take advantage of the Colts' non-existent running game and absolutely wear Andrew Luck out with pressure. He'll make some plays and they'll probably score 24 points but Manning and the Broncos' offense is going to score a lot more than that.